Start to run! Have you ever wanted to start running, but are there still a few things that stop you? Sounds very familiair! Too cold, too warm, tired and so on. But what didn't cross your mind yet is all the stories about that 'runner's high' (endorphins), the fact that running reduces depressive feelings, you getting fit and it reduces the risk of heart diseases! And we haven't even had the change to tell you how lovely it is to be outside. You know what, you don't need to run the 200 meters like Dafne Schippers. Just go outside, run for a while and when you're tired you just continue walking. The bar doesn't always have to be set so high. As long as you're having fun! Okay, enough about this. Now I think I convinced you to go out for a run today or tomorrow. Below is a guide for running for beginners. 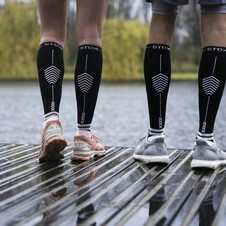 To help you a little and reduce the risk of injuries you wear STOX Running Socks. 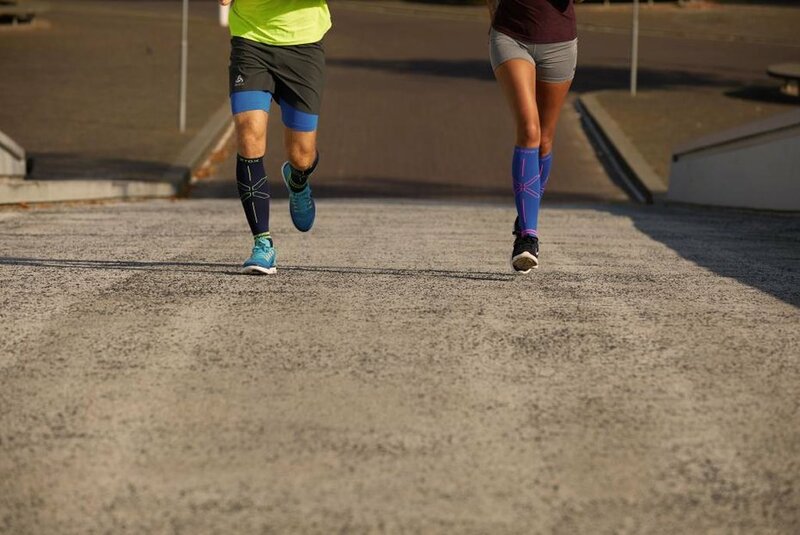 These compression socks optimize the blood flow in your legs and provide maximum oxygen-capacity to the muscles. Experience energetic legs during your run! The STOX® Energizing Flow decreases muscle fatigue and stimulates blood lactate removal, which enhances recovery. 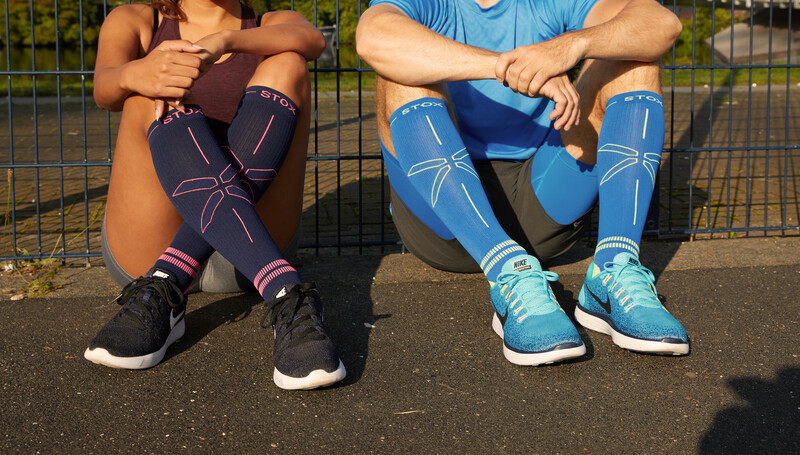 The Running Socks create a shock absorbing effect, therefore decreasing damaging the muscle tissue to a minimum. 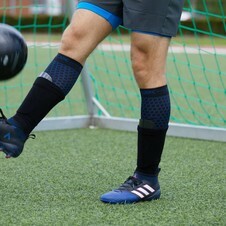 Ideal is to combine the Running Socks with STOX Recovery Socks. 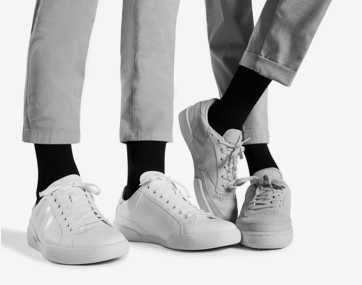 You wear those after your run and they improve the drainage of blood and fluid, which fastens the healing process of injuries like shin splints, calf and Achilles tendon problems. They feel really comfortable and immediately bring relief. Okay, now you're ready! It's important to start every training with a warming-up and to end each training with a cooling down. Your pace ​should be so that you can still talk. Can't talk anymore because you have to gasp for breath? Just slow down a little. The training through this guide for running will take about 10 weeks. How many kilometers you can run by that time depends per person. We do not want to put pressure on you, because you just have to have fun and enjoy your training. Some people run 5 kilometer after 10 weeks, while others run 3 kilometer. Both are great!